Melon Mango Smoothie is a cool summer drink. 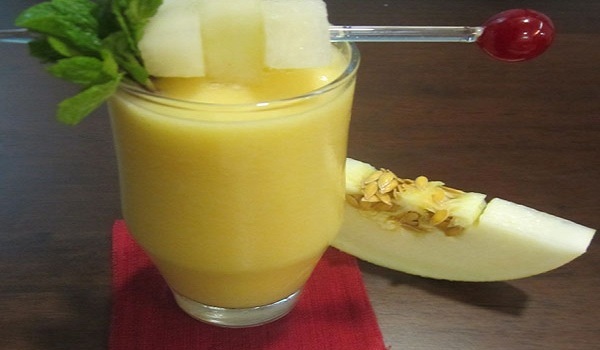 Learn how to make/prepare Melon Mango Smoothie by following this easy recipe. Cut and peel the muskmelon into wedges and remove the seeds. Chop the wedges into half 1cm pieces, and chop the remaining into large pieces. In the same way, peel and chop mangoes, one slice into small 1cm piece and the other into large cubes. Place the large pieces of mangoes and melon into a blender and add strawberry crush and a cup of crushed ice. Blend it until smooth and frothy. Pour into individual glasses and serve topped with a few pieces of finely chopped melon and mango.